Time is running out for Prime Minister Alexis Tsipras to unlock the funding from the international lenders to prevent defaulting on Greece’s debt. The Greek government must make a $1.9 billion debt repayment to the International Monetary Fund by the end of this month. Money it currently doesn’t have. Prime Minister Alexis Tsipras has called for unity within his fractious Syriza party. "Alexis Tsipras believes we are now at the most crucial point of the negotiations and the party must play a substantial role in supporting the government in this effort," a government official said in a statement. Elias Papaioannou, Associate Professor of Economics at the London Business School told Sputnik that "the current situation is unbearable". 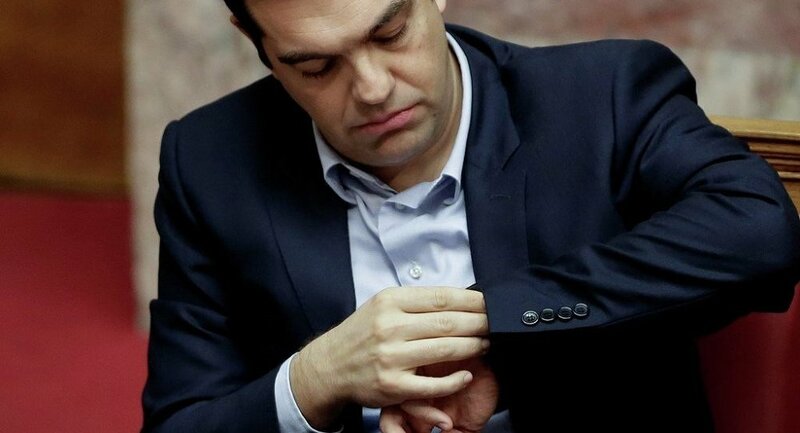 "The deal has been delayed for no good reason, destroying trust both in the Greek government and Troika [auditors representing the Commission, the European Central Bank and the IMF]. "Three months has been lost through agonizing and we need to proceed as quickly as possible. The current situation is really unbearable," said Papaioannou. Professor Papaioannou, who is currently in Athens told Sputnik that he believes the Greek people want to remain in the Eurozone. "Talking to people on the street, there is a strong will to stay within the core of the European Union and be part of the Eurozone. This is remarkable because the Greek people have suffered considerably. The crisis has been prolonged; the economy is now in its seventh year of contraction. Unemployment has jumped from around eight percent to 25 percent — but despite the suffering, the people want to maintain their position in the Eurozone." Speaking from Athens Papaioannou said: "It’s a depressing situation in Greece; the current administration has been pushing a disaster strategy by being so indecisive since February and extending the deadline to make an economic agreement, which is affecting the markets and the mood on the street. The current administration is playing with fire". German Chancellor Angela Merkel and French President Francois Hollande are due to hold talks with Tsipras. Merkel has already stressed the urgent need for an agreement. According to Professor Papaioannou, the Greek government will be forced to impose harsher austerity measures than it would have done eight to ten months ago. "Unfortunately power in the Greek government has been lost because the economy has contracted so much in the last six months – because of the indecisiveness of the Greek government to break a deal with Troika. "A Grexit is not a likely scenario. I’m more worried there will be a Graccident due to the government’s incompetence, its anti-EU rhetoric and for keeping Greece in limbo for the last ten months." And the clock is ticking in the patience of other European leaders. According to Finnish Finance Minister Alexander Stubb: "We will do everything to keep Greece in the Eurozone…but our patience is running out".